Presenting Speed-eSAX! Networking has never been so fun! 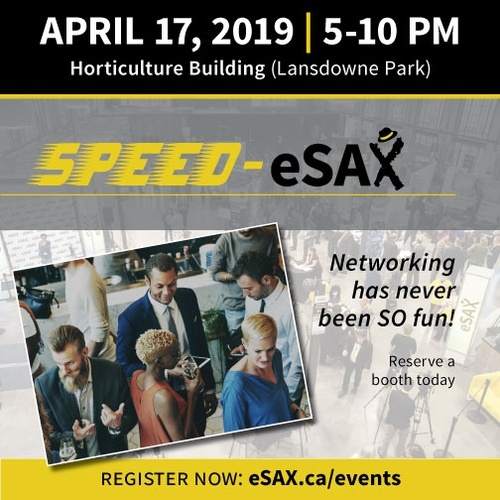 eSAX (The Entrepreneur Social Advantage Experience); is an entrepreneur networking community and tradeshow for small business to create connections, gain knowledge and promote regional economic collaboration among Chambers of Commerce and community/business leaders. Events are held every 3 months (January, April, July and October). Join us as we reshape Ottawa’s entrepreneur community and raise funds for the CHEO Foundation, Max Keeping Fund & Ability First Ottawa! Powered by Media Mall, Ottawa Special Events, ShopOttawa.com, Pita Pit, Sure Print & Graphics, Bytown Video Productions, Deez-Picz & VIDZ, Talk To The Mike, East Coast Limos, Illumabilities, Signal 88 Security, and Sax Appeal. p.s., bring your enthusiasm and plenty of business cards!